A discovering party may move for sanctions under Rule 2-433 (a), without first obtaining an order compelling discovery under section (b) of this Rule, if a party or any officer, director, or managing agent of a party or a person designated under Rule 2-412 (d) to testify on behalf of a party, fails to appear before the officer who is to take that person's deposition, after proper notice, or if a party fails to serve a response to interrogatories under Rule 2-421 or to a request for production or inspection under Rule 2-422, after proper service. Any such failure may not be excused on the ground that the discovery sought is objectionable unless a protective order has been obtained under Rule 2-403.
a nonparty deponent fails to produce tangible evidence without having filed written objection under Rule 2-510 (f). A motion for an order compelling discovery shall set forth: the question, interrogatory, or request; and the answer or objection; and the reasons why discovery should be compelled. Instead of setting forth the questions and the answers or objections from a deposition, the relevant part of the transcript may be attached to the motion. The motion need not set forth the set of interrogatories or requests when no response has been served. If the court denies the motion in whole or in part, it may enter any protective order it could have entered on a motion pursuant to Rule 2-403. For purposes of this section, evasive or incomplete answers are treated as a failure to answer. If a party fails to comply with a request of a nonparty made pursuant to Rule 2-402 (d) for production of a statement, the nonparty may move for an order compelling its production. A motion for an order compelling discovery or for sanctions shall be filed with reasonable promptness. A motion for an order compelling discovery or for sanctions shall be filed with the court in which the action is pending, except that on matters relating to a deposition, the motion may be filed either with the court in which the action is pending or with the court in the county in which the deposition is being taken. 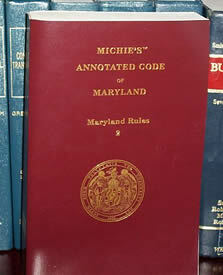 These are some of the more significant cases involving the interpretation of Maryland Rule 2-432. Bord v. Balt. County, 220 Md. App. 529 (2014): A trial court cannot impose sanctions on its own without a party first moving for an order to compel for sanctions under Rule 2-432. This is a crazy case involving a gun dealer trying to get back guns seized by the police and the ATF. After a directed verdict at trial, the gun dealer appealed arguing that the police's failure to provide photographs during discovery prejudiced that would have established the police's unlawful conduct. Rodriguez v. Clarke, 400 Md. 39, 926 A.2d 736 (2007): Failure to respond to a motion to compel answers to expert interrogatories can lead to the sanction of not being able to put on experts at trial (which is almost invariably fatal to plaintiff's case). This case underscores the wide discretion judges are afforded in applying sanctions for discovery failures.